Tucson is fast approaching two great seasons of family-oriented activities this spring and summer. The 2017 calendar includes some of the best arts and entertainment events the Southwest has to offer. See what’s on our Do Not Miss list and get your tickets to the fun. Frida Kahlo: Art, Garden, Life: The exclusive event which has been running since October 2016 will explore the iconic artist’s love of nature both in her paintings and home gardens. Designed by the New York Botanical Gardens, the beautiful works of art are available only at the Tucson Botanical Gardens. The exhibit will include lectures, poetry readings, Mexican plant tours, evening admission and dinner during Frida Fridays, and Frida for Children. 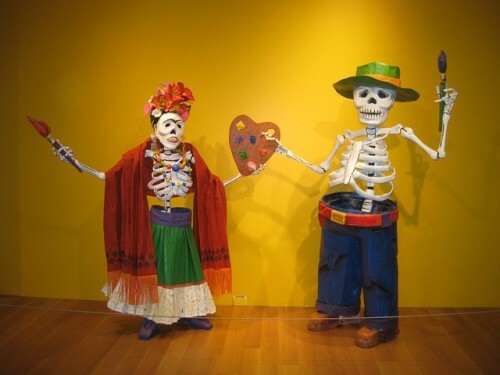 The Frida Kahlo exhibit ends May 31st. Additional information and general garden admission tickets are available by phone at 520-326-9686. Spring Chalk Art Festival: Join dozens of artists as they create colorful 8 foot murals at this free art festival taking place on April 29th. From 11am to 6pm, attendees can watch art come to life or grab a piece of chalk and create their own pavement masterpiece. Hosted by the Southern Arizona Arts and Cultural Alliance, the chalk fest features a KidsZone and complimentary chalk with a designated space for individual creations—professionalism not required. Arizona International Film Festival: From April 19-30, Tucson will host the 26th film festival throughout a variety of venues. With an emphasis on diversity, the theme ‘Bridging Cultures’ will be evidenced in such films as ‘Across the Tracks,’ ‘Good Cop, Good Cop,’ and ‘Bitter Coffee.’ Tickets are available from single screening admission to an All Access Pass. Filmmakers can submit independent films for consideration at withoutabox.com. Tucson Folk Festival: Since 1986, the Tucson Folk Festival has provided the Old Pueblo with free entertainment as one of the country’s oldest folk music festivals. May 6-7 marks its 32nd annual celebration featuring The Black Lillies, Billy Jonas, and local headlining duo Ryanhood. From soul to country and from homemade instruments to classic acoustic performances, the festival is bound to bring a mixed bag of talent to the city’s lively music scene. Volunteers are welcome for all events from the children’s stage to the songwriting competition. Paid memberships are also encouraged to help offset the costs associated with bringing this beloved annual event to the public. El Dia de San Juan Fiesta: Kick summer off the right way with a Tucson tradition. On June 24 from 5-10pm, Downtown Tucson will transform into a celebration marking the beginning of the monsoon season. People of all ages will enjoy the fiesta’s mariachi band, folklorico dancers, and Mexican cowboys performing tricks. Families are welcome to purchase food onsite from vendors and settle in for the ceremonial procession. A Modern Gem and Jewelry Collection: Presented by Somewhere In The Rainbow in partnership with the UA Mineral Museum, American Gem Trade Association, and Gem-A, the exhibit features a curated collection of gemstones from all over the world. Don’t skip the Buddha Blue sapphire from Sri Lanka cut in 1500 AD or the gem cutting exhibit for a closer look at the intricate process. Admission is $14 for adults, $10 for children 4-15, and free for kids under 4 years old. The collection will be available for the remainder of 2017. For a full schedule of things to do in Tucson, visit the city’s events calendar. Contact us if you have any questions about our luxury Dove Mountain homes for sale. Call: 877-451-7205.